NEUTRADEX® is formulated to combat the effects of acidosis and dehydration, particularly after fast work. Neutradex® also encourages horses to drink, increasing the action of the kidneys in clearing toxic waste produced by hard exercise. Horses with a history of ‘tying-up’. Preventing muscle soreness after fast work. Active ingredient citrate buffers acid build-up. Has a gentle diuretic effect which encourages the kidneys to flush toxins from the body. Ensure an adequate supply of cool, clean water is accessible. 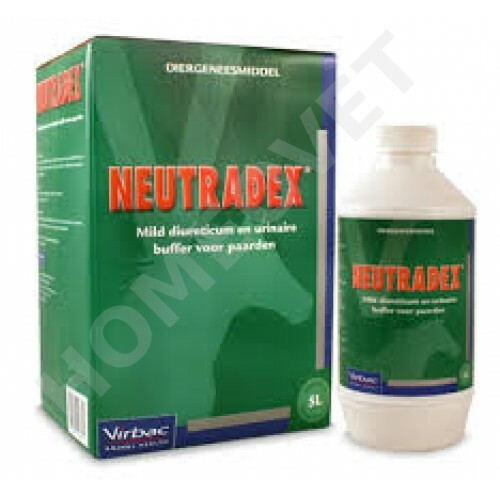 NEUTRADEX® exerts a mild diuretic and neutralising effect on acidic substances which accumulate in the muscles and blood stream. Metabolic acidosis may impair normal muscular function, thereby interfering with performance. Dehydration, which can cause sluggish blood flow and impaired tissue oxygenation, can be effectively assisted by the administration of NEUTRADEX®. In horses, NEUTRADEX® may also be prescribed as a co-treatment in kidney, bladder and urinary tract infections. Horses (450 – 500 kg): 28mL of NEUTRADEX® added to the feed daily. Following hard or fast work or racing, give 50 mL NEUTRADEX® orally (by syringe over the back of the tongue). Horses suffering from dehydration need a supplementary daily ration of electrolytes. NEUTRADEX® can be safely used with balanced electrolyte supplements based on the particular work program. HUMIDIMIX® - use daily for heavy sweaters such as trotters, pacers, endurance horses and eventers. STRESSALYTE® - use daily for gallopers such as thoroughbreds. RECHARGE® - apple flavoured “sports drink” for rapid post-work replenishment at a dose of 40-80mL over the tongue for immediate response. It has a similar composition to horse sweat and also contains glucose for energy replacement. Make sure the horse has access to fresh water. Give 50mL NEUTRADEX® over the tongue as soon as possible after very hard or fast exercise to neutralise acid and stimulate drinking. Do not use NEUTRADEX® within 24-36 hours before competition. Use immediately after hard work and after warm down exercise is completed, for one to two days. Ensure fresh water is available at all times after dosing. Add to the feed daily or give over the tongue. Ensure fresh water is available after dosing. Use only as directed. Note: The active constituents in Neutradex® are not, to our best knowledge, prohibited substances in any racing or competition jurisdictions. However users are encouraged to check with their respective authority prior to the use of any supplement or medication.